Eva Bartlett is a Canadian justice activist and freelance journalist and has been to Syria twice this year. Read other articles by Eva, or visit Eva’s website. The interview below was reproduced with the author’s permission. It was originally published on Dissident Voice on August 22, 2014. 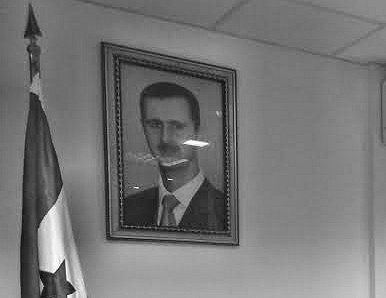 In June, 2014, Eva Bartlett met with Dr. Ali Haidar, Syria’s Minister of National Reconciliation, in his Damascus office. 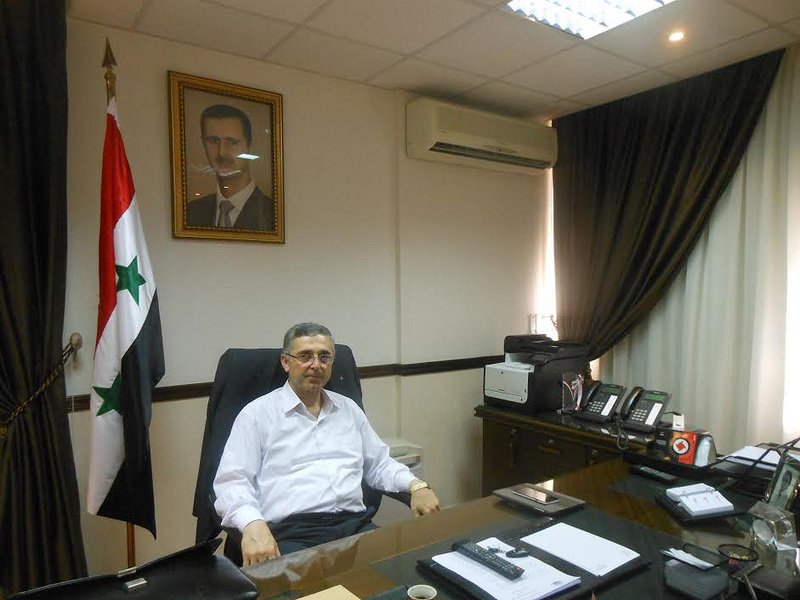 An eye surgeon and leader of the SSNP (Syrian Social Nationalist Party, an opposition party within Syria), Dr. Haidar assumed position as Minister of Reconciliation in June 2012. Dr. Ali Haidar. Photograph by Eva Bartlett. After much discussion in Parliament, we drafted the paperwork requesting to start a Reconciliation Ministry. President Bashar al-Assad supported the idea, and the Ministry was established in June, 2012 when the President decreed the formation of a new cabinet. Reconciliation isn’t that we are making a deal with armed insurgents. The idea is to restore the state of security in Syria. In our work towards reconciliation, we look at two main sectors: One, the insurgents, and the other, Syrian civilians living in areas controlled by the insurgents. Regarding the insurgents, we differentiate between the Syrian insurgents and the foreign militias. The latter refuse any dialogue with the government and are simply terrorists in Syria. And unfortunately, they are large in numbers and are the leaders of the dominant insurgent groups. The only people we communicate with are armed Syrians, not with the foreign militias. We encourage armed Syrians to cut any ties with the foreign militias. Then, we negotiate with them on how to reconcile. We’ve been very successful, in many areas, having them disarm and go back to their normal lives. We’ve hadthousands of successes. The second focus is on Syrian society. Syrians are suffering in all respects: their security and safety, the economy, social services, education, the large number of martyrs and injured, the kidnapped, the missing, the internally-displaced… We are trying to find a solution to each one of these cases. That is the deepest meaning of ‘reconciliation’: to return people to their normal lives. EB: What is the role of grassroots activists in the Reconciliation effort? AH: Although there are citizens involved, it is not a ‘grassroots’ movement; it came from the government to the people. One week after establishing the Ministry of Reconciliation, I went to Homs to begin working on the reconciliation which we are seeing today. In Homs, it has been a long process, because each area has its own mentality, own society, so we have to deal with each area individually. the Old City is different than that of Waer district, for example. We are evaluate each area, whether there are armed fighters or not, foreign or local, whether we can negotiate with them or not, whether they are supported from outside or not, the number of civilians in the area and the degree of their suffering. All of these factors determine our success in reconciliation. This is what we are working on nationally. EB: What guarantee is there for the return to civil life of those armed men who lay down their weapons? AH: When Reconciliation first started, people wanted a guarantee that they would not be persecuted by the government. At first, in Homs, five people laid down their arms, and soon after they were released. Today, thousands have joined reconciliation, this is the guarantee to others. Those who have laid down their arms have not been arrested. We confront the allegations of Western media with the truth on the ground. As an example of the reconciliation process, in Homs we established the Andalus school for rehabilitation. The armed fighters went from their area to this school, received everything they needed, including access to phones to contact their families. They spent a few days there, had meetings for rehabilitation, and returned to their families and are living with their families. EB: Where have reconciliation efforts been successful? AH: In many areas. The first reconciliation, and which has not been widely acknowledged, was in Banias, one of the first areas where armed people and problems occurred. For a while it was a very dangerous place, and today is one of the most beautiful and calm cities in Syria. In the countryside of Latakia there were battles, but now it is largely calm, people are living normal lives. In the suburbs of Deir ez-Zor, the town of Quriya was the base of al-Qaeda-allied insurgents, has been restored to security. In Homs and its countryside we have had excellent successes. North of Hama, south of Idlib, there have been more areas reconciled. And aside from Homs, Damascus and its suburbs—like Zabadani, Berza, Moadamiya—are our largest successes. Now were are working in the suburbs of Aleppo and Idlib, in Qunitra. Even in Daara we’ve had successes. The Reconciliation project isn’t just in one area, it is nationwide. EB: Are areas along Syria’s borders more difficult areas in which to achieve reconciliation? AH: In areas close to the borders of Turkey, Jordan, Palestine it is more difficult, because of outside intervention, and because at the moment the government cannot control all of those borders. When the government was able to take control of the border with Lebanon, they were able to bring calm to the towns near the border, with a few exceptions. Turkey and Jordan have opened their borders and allowed al-Qaeda and other terrorist groups to base themselves in their countries and cross into and out of Syria. They give them all sorts of support. These areas are battlefields, not civilian areas, so it is more difficult to bring calm, reconciliation, in those areas where foreign terrorist groups reside. More than eighty percent of Syrian people live in or have fled to safe, government-controlled areas. Ten percent have fled Syria, and ten percent are in areas controlled by the armed groups. In all areas where there are foreign-backed militias, like Jobar, Yarmouk, Harrasta, Waer, Idlib suburbs…the armed groups have prevented reconciliation, even killing those who attempt to lay down their arms. EB: Has there been any external, political, support from the United Nations or any others outside Syria? AH: We don’t get any political support, except from countries who are friends of Syria. To the contrary, America, Britain, France, Turkey…they have attacked the idea of reconciliation. Hillary Clinton publicly called for the armed groups to never give up their arms. Erdogan told them not to join reconciliation. Some of the armed groups’ sheikhs and Saudi sheikhs and have issued fatwas (religious edicts) that it is ‘haram’ (forbidden) to give up their arms. Even though I’m the head of a Syrian opposition party, and joined the government from the position of an opposition party, because I’m involved in reconciliation, the EU put my name on its travel ban list, and would have frozen my bank accounts, but I don’t have any foreign accounts and have no plans of leaving either Syria or the government. In the beginning, I tried to speak with those few ambassadors who had not yet left Syria, to no avail. I told them that I am ready to go to their countries and meet with any Syrian citizens there, as well as media, and discuss reconciliation. AH: Reconciliation is like a marathon: there are those who’ve reached the end, those who are a few metres away, and those who are slow. In the past two years, more than 10,000 Syrians have reconciled and returned to their homes and normal civilian lives. Following our discussion, I learned of Dr. Haidar’s own loss, like that of Syria’s Grand Mufti, Dr. Ahmad Badreddin, whose son Sarya was assassinated in October 2011. During the funeral, while sobbing, the Mufti called for forgiveness and reconciliation and forgave those who murdered his son.